And not only that, but he can also run his first marathon under the 4 hours! Yes, I have finished my marathon last Sunday in Ljubljana, capital of Slovenia, in much better time than I have expected. After six months of training and preparing for the event, I showed myself at the starting line at 10 AM, on chilly but fresh autumn day, ready to run my first marathon. For those of you who think that preparing for a Marathon is easy task, I have to say that during my preparations I bought 2 pair of shoes, running shirts and shorts, special running watch with pulsmeter (Polar RS200SD), and spent on average 5-6 hours a week running. 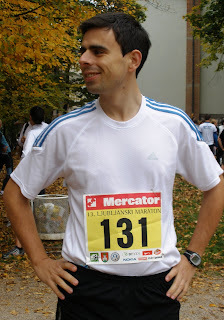 Marathon was run in two circles around Ljubljana. We were passing through the city center and also through the more rural areas of the city, in some of which we were even looked upon by some local cows. First circle went pretty well for me, I was fresh, had a lot of energy and even achieved my best time in half-marathon. Then, in the second circle, the real race began. I was running without stopping until 34th kilometer, but then, under much fatigue, I started to combine walking and running for the next five kilometers. But, in the last kilometers, I used my last reserves of energy and run for the total time of 4 hours, even passing some runners in the last kilometer. Usually, people run their first marathon between 4 and 5 hours, and I was very proud to be able to run under 4 hours. I have to say special thanks to my girlfriend Ivana, who was great support to my effort, and to few of my IEDC MBA colleagues, especially Aurora and Martin, who came to support me. Also, the public was fantastic, boostering my energy level during much of the path, especially in the last kilometer. At the end I received a medal for my accomplishment, and a massage for my devastated legs.